The iconic Coachella Music Festival began in 1999 and every year sees thousands of attendees from across the globe in attendance. 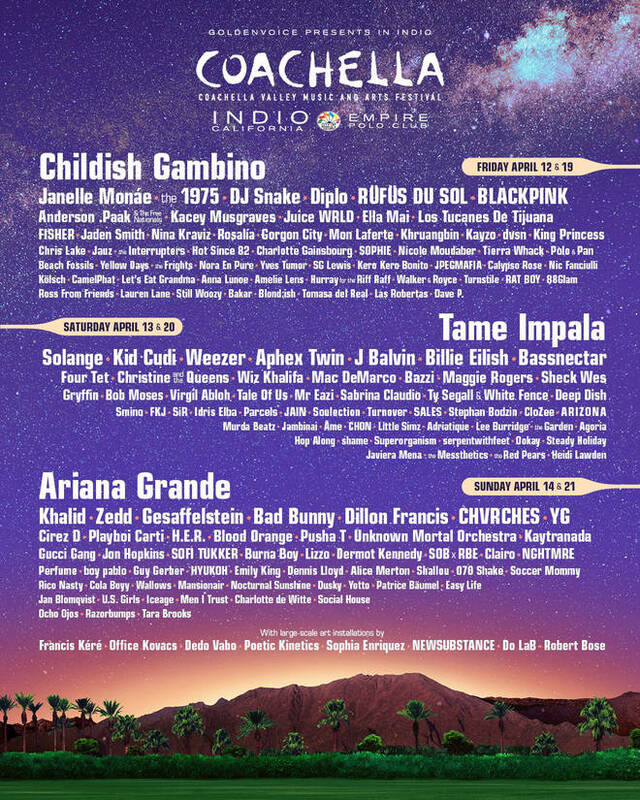 The event features many genres of music, this year Childish Gambino, Tame Impala, Solange, Ariana Grande and Khalid will be performing as well as many other amazing artists. The Festival includes several stages including Coachella Stage, Outdoor Theatre, Gobi Tent and the Sahara Tent. The festival is one of the largest, most famous, and most profitable music festivals in the United States. Festival tickets sell out in minutes! These tickets will give you access to the venue, day parking lots and the TWO venue VIP areas during all 3 days. Guests can also visit camping areas. The main VIP area is located adjacent to the main stage (under white peaked tents) and consists of shaded areas, picnic tables, couches, extra restrooms, food & beverage vendors and a full cash bar. The second VIP area is located directly next to the Sahara tent in the beautiful Rose Garden complete with seating, extra restrooms, food & beverage vendors, full cash bar, a spectacular view and thousands of roses. These are the highest calibre passes available to anyone not actually performing or working at the festival and are significantly better than anything publicly sold for VIP. Access includes all normal VIP access plus access to backstage and side stage access during performances with unlimited water, beer, soft drinks, and onstage access (Access is limited during certain performances and up to artists’ discretion). Get advantage of prime viewing via artist guests viewing areas which are located at the front of each stage barricaded off from the crowd. They are within the first 20 feet of space right in the front of the stage and are gated off for ARTIST GUEST ONLY. Additional access includes all VIP areas, artist and VIP bathrooms, festival golf carts/shuttles located behind main stages, access to artist entrance and exit located behind main and side stages and access to VIP parking close to the front entrance (additional fee). With these passes, backstage access is the biggest perk. CHILL. It’s more than a temperature – it’s a state of being. From lounging in cooling pools and enjoying dive-in movies to sipping iced drinks and completely unwinding – discover all the ways to get your chill on this festival season at La Quinta Resort & Club, the desert’s coolest hideaway. Rates Include All Hotel Taxes, Fees & Breakfast Daily. Prepaid, Non-Refundable. Includes access to all Artist Guest and VIP inclusions. Artist is the highest level of access and the same wristband that the artist wear. There are also special artist viewing areas close to the stage. Access to the VIP areas, including the main VIP area which is located adjacent to the main stage (under white peaked tents) and consists of shaded areas, picnic tables, couches, extra restrooms, food & beverage vendors and a full cash bar. The second VIP area is located directly next to the Sahara tent in the beautiful Rose Garden complete with seating, extra restrooms, food & beverage vendors, full cash bar, a spectacular view and thousands of roses. One of the most buzz worthy parties of Coachella is undoubtedly this event, which is taking place on first Saturday between 10pm and 3am. It’s being held on the Tradition Aviation airplane hangar near the festival grounds and will include rides, carnival games, cocktails by Svedka Vodka, and DJs like Jus Ske. Revolve is hosting their annual two-day VIP party at a private residence with special performances, DJ sets, food trucks, and festival games. Always the best pop-ups globally. At a private mansion. Expect surprise A-list performances and an impressive guest list. John Terzian and the H.Wood group are back for their annual, celebrity-frequented party at a private residence. Hosted by McDonald’s, expect a high-profile crowd and guest performances. During Weekend One of Coachella, Republic Records will host its top executives, artists, and influencers at the Dupont Estate – a private, luxury compound in La Quinta, CA. The festivities will kick off with poolside barbeques each day, featuring DJ sets by artists from Casablanca, Republic’s EDM label. Tastemakers will be invited to unwind or wind up in the sun and enjoy cocktails & new tunes before the festival. Republic Records Artists include Ariana Grande, Drake, Florence and The Machine, Lorde, Nicki Minaj, The Weekend, Tiesto, Zac Brown Band and many more! Artist Parking: £1,500 each (Artist Parking makes the experience 10 times better, only 500 cars and it is through a street blocked off to the public).